MP3, Rightclick, download locally, then listen. 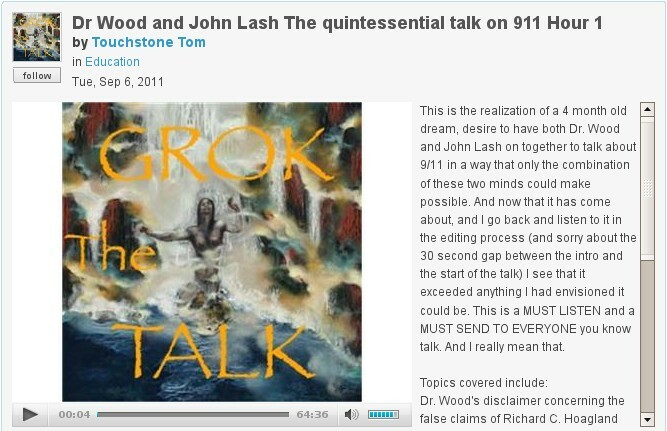 This is the realization of a 4 month old dream, desire to have both Dr. Wood and John Lash on together to talk about 9/11 in a way that only the combination of these two minds could make possible. And now that it has come about, and I go back and listen to it in the editing process (and sorry about the 30 second gap between the intro and the start of the talk) I see that it exceeded anything I had envisioned it could be. This is a MUST LISTEN and a MUST SEND TO EVERYONE you know talk. And I really mean that.